Don’t worry if you don’t know exactly what needs to be done to the trees on your property. Randal, Melissa and our expert team are able to assess each individual situation to come up with the best possible course of action for you. 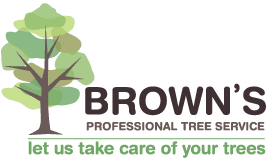 At Brown’s, we don’t just offer tree services! We also have crane trucks available for hire to meet your every need. Additionally, Brown Brothers Firewood supplies great quality firewood to the Gympie area. Simply give us a call, and we will be happy to help you out with exactly what you need.